Your body has more secrets than the CIA. Discover how your body truly reacts to exercise and uncover the truth about nutrition timing and workouts. Going the distance may be a cliché, but finishing an endurance race requires proper fuel in ample amounts. Just as you wouldn't take off across a desert highway with four bucks of cheap gas in your Ford Taurus, you wouldn't start a 10K on a bag of Doritos. Would you ...? Hell naw! At least you won't after reading this article. Fact: If you're an endurance athlete of any kind, or engage in steady-state, long-duration cardio, you may sabotage your workouts by not implementing proper "nutrient-timing" (NT) strategies. Nutrient timing concerns not only what to eat but when you eat it. Timed correctly, nutrient intake maximizes hormonal responses to nutrition; it allows you to get the most out of your performance and recovery. NT recommendations are slightly different for the endurance athlete than the strength athlete. In both cases, NT guidelines focus specifically on pre-workout, intra-workout, and post-workout nutrition. Bear in mind, these guidelines are for normal, healthy individuals with no known metabolic disorder or other disease. Think of the 3-to-4 hours before a workout as the time when you "fuel up" with carbohydrates before your training session. It's important to remember that glycogen reserves in your muscles are limited. If your session is of moderately high intensity (65-85% VO2 max), then glycogen reserves may last anywhere from 90 minutes to 3 hours. As your glycogen levels diminish with exercise, your muscles will break down. Proper nutrition on the front end can inhibit muscle breakdown and keep your energy level up through the workout. Research has also shown that pre-exercise consumption of carbohydrates and protein can also increase muscle protein synthesis, leading to more efficient muscle growth. 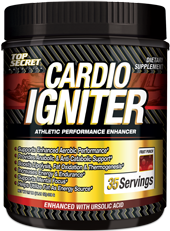 Find Cardio Igniter on our store. Pre-workout NT guidelines vary depending on the intensity and training level of the athlete, but general guidelines for a pre-exercise meal are 1-2 gm/kg of carbohydrates and .15-.25 gm/kg of protein 3-to-4 hours before a long-duration, moderate- to high-intensity workout. For a 150-pound individual that equates to around 68 grams of carbohydrates and 14 grams of protein as the pre-exercise meal. 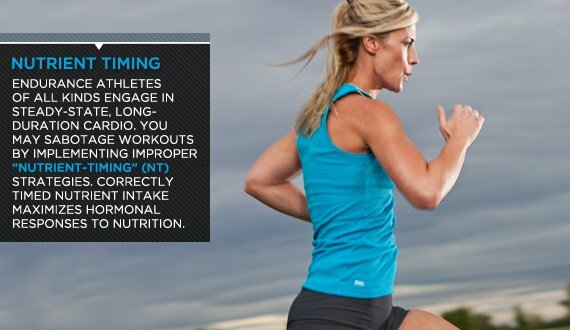 Carbohydrates and protein are also recommended within an hour of starting of your workout. Since different people tolerate pre-workout meals differently, an easy and effective way to take in these nutrients is a pre-workout shake or dietary supplement mixture. Decreasing muscle glycogen levels during exercise are a major factor in exercise performance. This is when intra-workout carbohydrate replenishment becomes critical. Some studies suggest that small amounts of carbohydrate replenishment, perhaps as little as 16 grams per hour, are adequate to maintain peak performance in endurance training. Other studies advocate higher numbers, but the optimal number of grams per hour is not set in stone. The key thing to remember is that the longer and more intense the workout, the more fuel you will need. A simple and effective way to replenish muscle glycogen while you work out is to consume a 6-8% carbohydrate solution, in the form of a hydration drink like Gatorade or Powerade, or fresh fruit. Many intra-workout supplements already contain meager amounts of carbohydrates. Your post-exercise goal is to replenish muscle glycogen rapidly and stimulate protein synthesis for tissue growth and repair. The 30-to-45 minutes immediately following your workout is a critical period when your body is extremely sensitive to nutrient delivery. Muscle protein synthesis is up to three times greater when ingesting carbohydrates and protein immediately post-exercise, as compared to two hours later. This is also when insulin can most effectively deliver glucose to the muscles. Since many endurance athletes have difficulty eating immediately post-exercise, a liquid carbohydrate/protein combination may be the best way to deliver nutrients to your tissues and maximize the benefits of NT. A common guideline is to consume approximately 50 grams of carbohydrates and 10-15 grams of protein within 30 minutes of completing the workout, keeping the ratio of carbohydrates to protein between 4:1 and 5:1. This can be easily done by ingesting a sports nutrition drink in combination with a high quality protein supplement. The right balance of nutrients following a workout can be effective in stimulating an "anabolic state," leading to more effective muscle growth. It also promotes better, faster recovery and promotes continuous growth and tissue repair around the clock. Scott Iardella is a strength and conditioning specialist, sports nutritionist, former sports medicine physical therapist, and former bodybuilder.